A leading nutritionist says GPs should send obese patients to weight-loss schemes rather than offer NHS help because they will see better results. Dr Susan Jebb of the Medical Research Council found in a study that people in a WeightWatchers programme lost twice as much weight as those with GP care. WeightWatchers part-funded the study, but Dr Jebb stressed similar schemes would be as effective. The National Obesity Forum said buying in services could benefit NHS patients. The NHS is currently running pilot schemes with WeightWatchers. GPs can buy one patient a 12-week course for about £45. It was a year-long scheme like this in Northampton that Dr Susan Jebb and colleagues studied, as well as two similar projects running in Australia and Germany. Over the course of a year, the Northampton GPs referred half of 772 overweight patients to weekly WeightWatchers meetings, paid for by the doctor's surgery. The other half received GP-led care. This typically involved things like providing leaflets about healthy eating and scheduled appointments with a nurse for weigh-ins and advice. The patients had their weight recorded at regular intervals throughout the year to see the results. At each measurement appointment, WeightWatchers came out best. By 12 months, that group had lost twice as much - nearly 7kg (15lbs) on average per patient, compared to around 3kg (6lbs) in the GP-led group. Although this amount of weight loss may seem small, the researchers say it can make a big difference in terms of health. Dr Jebb said: "Losing four to five kilograms can halve a person's diabetes risk if they are overweight, so even a little can be beneficial. 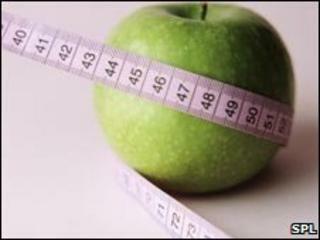 "We know a lot of people are overweight and need to lose weight. The challenge is how you do it. "In the NHS we do not have the resources for a massive weight management programme. But this would be cost effective." But Dr Jebb said that WeightWatchers was not unique, and that any similar programme involving regular weight checks, goal-setting and peer support could achieve the same. "It's having a weekly weigh-in and the accountability it brings with it, as well as the support of the group, that seems to work. "People are more likely to stick at it." Fewer patients in the WeightWatchers group dropped out of the trial than in the GP-led group, although compliance was a problem generally, with just over half of the patients completing the trial overall. Dr Jebb stressed weight-loss schemes would not be suitable for everyone, and GPs should bear this in mind. "Men may not feel it's the right group for them, nor some ethnic groups. It's certainly not some panacea for the nation's weight problems. "But GPs can now be confident that here is a way they can really help some of their patients that's based on evidence." The health advisory body National Institute for Health and Clinical Excellence (NICE) already recommends in guidelines that GPs should consider referring overweight patients to a commercial provider. Dr Brian Karet of the Royal College of GPs said it was important that patients had the motivation to shed excess pounds. "Many GPs will try and find out how determined people are to lose weight, using techniques such as motivational interviewing, but it helps enormously to have a locally available group-based programme to then point people towards. "Primary care trusts and commissioning groups should certainly consider setting up locality-based groups like this, or buying in to one of the commercial providers of weight loss support such as WeightWatchers." Tam Fry of the National Obesity Forum said: "GPs are generalists by definition whereas WeightWatchers are the 'consultants' in their field. "It's therefore not surprising that the latter achieve the better results. "Referral to any organisation with a proven weight-loss system which can be replicated anywhere has to be the best option for the patient, the GP and the NHS. "It may upset some PCTs to use commercial suppliers - but they do produce value for money." The trial will be presented at the International Conference on Obesity in Stockholm this week.